In the wake of tremendous losses from abnormal natural disasters recently, cities and provinces in Vietnam—coastal, river delta, mountainous and highland alike—are more and more acutely aware of the growing threats from climate change. However, city planners, academics, and urban policy makers still have limited recognition of climate change resilience approach in urban development. This is a dominant story line highlighted by the work of the Asian Cities Climate Change Resilience Network (ACCCRN) and many other climate change resilience projects in Vietnamese cities during recent years. City planning and development practices are shown to typically lack the climate resilience lens. At both the national and local level, the linkages between flooding, sea level rise and urban development are only beginning to come into focus. 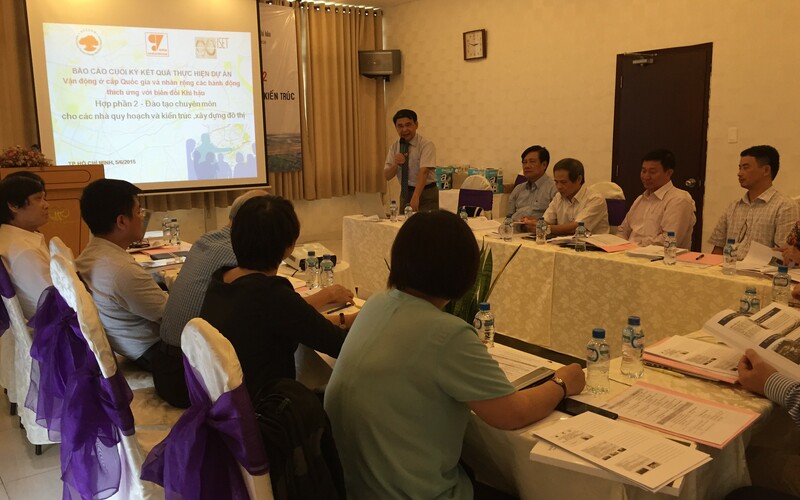 Under the Vietnam national engagement project of ACCCRN, the Institute for Social and Environmental Transition (ISET) in Vietnam and the Vietnam Urban Planning and Development Association (VUPDA) are working with various partners across the country in an effort to address this gap. The idea is to accelerate and sustain the development of knowledge and capacity of urban professionals in urban climate change resilience (UCCR) through developing and delivering training modules that incorporate these currently quite separated realms of knowledge. Assessed training needs, professional resources and experience in UCCR in Vietnam. The survey helped identify any university faculty with research or teaching experience in this field, and any professional experience or case materials that could serve as the foundation for designing a training course for urban planners and architects on this topic. Completed four city case studies for classroom application with accompanied classroom activity plans, developed a curriculum of 10 lectures and accompanied classroom activity plans, and organized a series of 4-day training courses in 06 cities of Vietnam, with lectures and classroom activities delivered/facilitated by experts who developed of the above-mentioned lectures and case studies. For all of the six training courses, the numbers of course participants were higher than expected because of high demand, especially from provincial government departments. Revised and improved the lecture modules after each of the training courses based on feedback from course participants. The current set of training materials and case studies can be found here. Provided course materials, reference documents and case studies to the university partners (Hanoi Architecture University, Hanoi University of Construction, Ho Chi Minh City Architecture University, Mien Tay Construction University, Da Nang Architecture University, Central University of Construction, Yersin Da Lat University) to use in their courses. All of the universities expressed interest in incorporating portions of the training materials in their undergraduate curriculum on Architecture, Urban Management and Urban Construction, either as a compulsory/optional subject, or a thematic portion in their current curriculum. Organized a review workshop on June 05, 2015, which representatives from the Ministry of Construction (MOC), Ministry of Education and Training (MOET) and universities attended and contributed valuable recommendations for next steps. The representatives all showed high appreciation of the project effort in generating quality training contents relevant to the current needs in building capacity for urban professionals in UCCR. The training program developed was evaluated as providing a good foundation for a university training curriculum for the planning and architecture majors. Universities shared that they have incorporated several lectures from the project into their current curriculum. The MOET is requesting universities to review their programs to incorporate disaster management and disaster risk reduction into their curriculum to various extents. However, to consistently integrate the materials into the universities’ program, the training materials should be developed into a full program of about 30 class sessions, which will allow the universities to better consider the adoption of the materials, while following MOET’s guidelines. The materials should also include contents on the impacts of climate change on technical infrastructure systems such as power supply, water supply, communication, and drainage, as well as guidance on resilience measures. To follow up with these efforts, the course organizers are developing the course materials into a Vietnamese language textbook aimed at senior level university courses in architecture and urban planning. This is an important step before the materials can be considered by MOC and MOET and become a standardized requirement in professional education courses on urban planning and architecture across the country, making UCCR capacities a norm for the future generations of professionals who will design and build our cities. 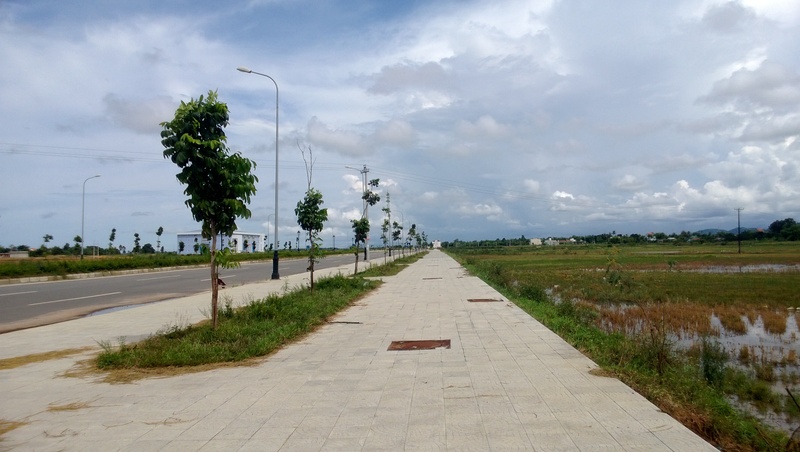 This entry was posted in Climate Change, English / Tiếng Anh, urban planning and tagged ACCCRN, architecture, training, urban climate resilience, Urban planning, VUPDA. Bookmark the permalink.